* Take 1 tsp oil in Microwave save dish and add the chopped coriander and green chillis and micro high for 2 minutes or until the rawness dries. *Remove from Microwave and cool.Grind the fried coriander and green chillis along with coconut,ginger garlic paste. *Take the remaining oil in a Microwave safe bowl and add the whole spices and fry for a few seconds.Now add the ground coriander paste and fry for 3 minutes and then add the chopped tomatoes microwave high of another 2-3 minutes. *Add the above mixture to the soaked rice, add water and microwave high for 10 minutes. *Serve it with chicken or just with raita. PS:I used 1 1/2 cup water to 1 cup rice and the proportion of water depends on the rice. Healthy and Aromatic coriander rice. Looks delicious! Yum! !such a flavourful rice, pls collect ur award from my blog..
Wow.. Chala bagundi Kotthimeera Annam.. Ma amma kooda ilage chesthundi... Nice click!! I love love corriander leaves and the rice looks delioious. Looks delicious, i do this but never added garlic. Will try next time. 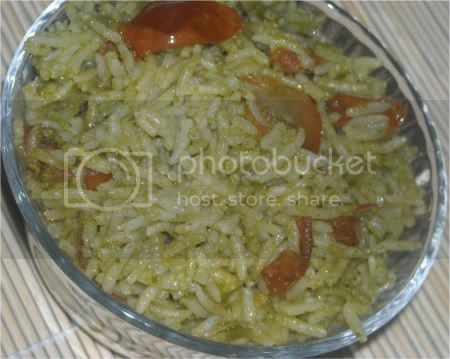 Wow...that's an really simple and yum rice recipe...looks glossy and yum. This coriander rice sounds so simple made in the mW yet delicious. Very flavourful and yummy rice. I love coriander rice, preparing in MC is so easy.